Despite high hopes that a planned US-North Korea summit will resolve decades-old animosities and a nuclear standoff, Pyongyang remains the “most imminent” threat to Washington, the outgoing head of US Pacific Command said. 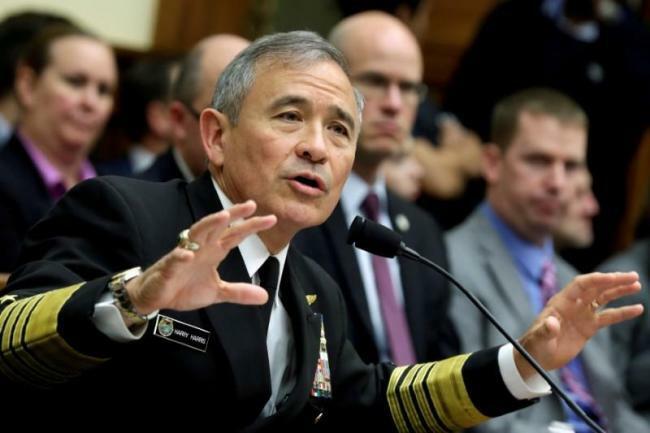 During his change of command ceremony Wednesday, Adm. Harry Harris, who is expected to become the next US ambassador to South Korea, also noted that China’s pursuit of hegemony in Asia would pose the “biggest long-term challenge” to the US and its allies in the region. “North Korea remains our most imminent threat. And a nuclear-capable North Korea with missiles that can reach the United States is unacceptable,” Adm. Harris said as he handed over the reins of the US Pacific Command to Adm. Phil Davidson at Pearl Harbor, Hawaii. His remarks coincided with the US military’s decision to rename the Pacific Command as Indo-Pacific Command, in what analysts view as a symbolic effort to improve ties with India amid China’s growing assertiveness in the region. North Korea and the US have been engaging in a flurry of diplomacy over the first-ever summit between US President Donald Trump and North Korean leader Kim Jong-un. The on-again, off-again summit is scheduled to take place on June 12 in Singapore. It is still not clear what kind of role Harris would play in the Trump-Kim summit and subsequent coordination between Seoul and Washington, but analysts said the admiral-turned-diplomat could be a “wild card” in what would be arduous negotiations with North Korea. “Even if the summit is successful, the US should be ready to continue sanctions and pressure until North Korea completely abandons its nuclear weapons. In that regard, Harris is a good fit,” said Park Won-gon, a security expert at Handong Global University. But Park predicted that Harris would tone down his rhetoric once he becomes a top US envoy to South Korea. “Those who have risen to the position of a four-star general know how to behave like a sophisticated diplomat,” Park added. If confirmed by the Senate, Harris is expected to fill the ambassadorship that has been vacant for 16 months. Harris had initially been nominated as US ambassador to Australia, but was asked to take the post in Seoul by then-CIA Director Mike Pompeo, now secretary of state. While at the helm of the most expansive US command for three years, Harris took a hard-line stance against China’s expansion in the South China Sea and North Korea’s relentless nuclear and missile tests last year.